A massive "Thank you!" to Gerd Leonhard for proving that he truly is a "media futurist" and for sharing his predictions on the future of selling entertainment at last night's social mixer. For once, I didn't have to quieten down the audience as Gerd's talk kept everyone in mesmerised silence! 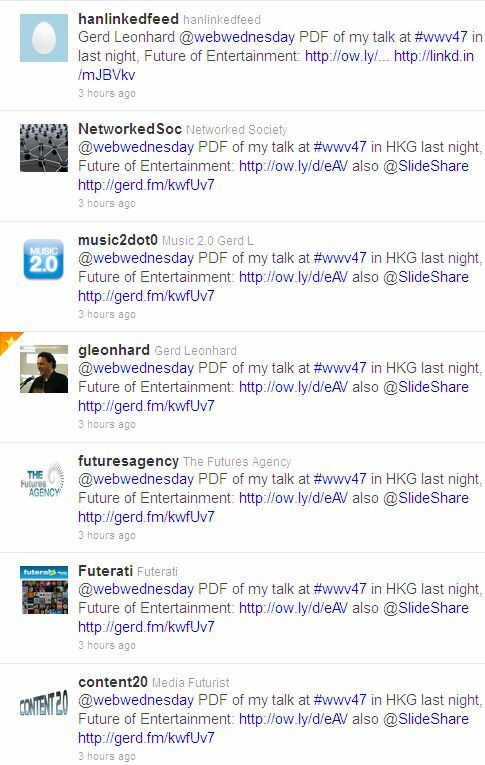 Not only is he a futurist but also a savvy marketeer; just look at this screen capture of Twitter to see him in action promoting last night's talk. 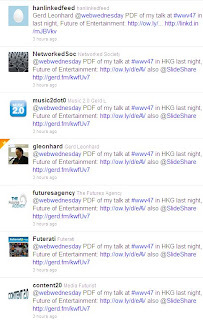 And here are his slides, hosted on Slideshare (slideshare.net/gleonhard) or download them from Owly. Until today, I had no idea that Hootsuite hosted documents in the cloud! (Thanks again, Gerd).